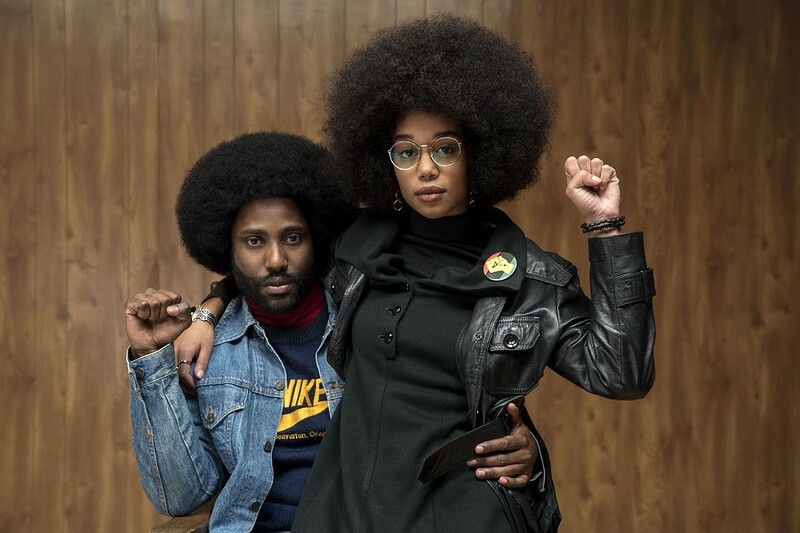 Review: BlacKkKlansman | Movies | Style Weekly - Richmond, VA local news, arts, and events. Spike Lee's latest features violent images from Charlottesville. Spike Lee's latest, featuring John David Washington and Laura Harrier, tells the true story of a black Colorado police officer who infiltrates the KKK. Spike Lee’s volcanic new film, “BlacKkKlansman,” understands that wars are initiated within the nebulous sphere of pop culture, which shapes our identities and emotions. Take the white supremacist rally that occurred a year ago in Charlottesville this weekend, which culminated in the murder of 32-year-old Heather Heyer, who was protesting the white supremacists. Such an atrocity is wrought from a careful cultivation of hatred, nurtured through a well-financed online machine. At the end of “BlacKkKlansman,” which has been released on the one-year anniversary of the Charlottesville rally, Lee fast-forwards from the film’s early 1970s setting to highlight footage of white supremacists in Charlottesville, including graphic shots of the car mowing through people downtown. Lee splices the infamous interview with President Trump, in which he equivocated the white supremacists with their protestors, with footage of swastikas being proudly bandied about in Charlottesville, along with the Tiki torches that were recruited as pathetic instruments of intimidation. With this postscript, Lee sidesteps an issue that dogged Ava DuVernay’s “Selma,” which celebrated Martin Luther King, Jr.’s civil rights victories without accounting for the modern voter suppression that runs rampant with the support of the Supreme Court. “Selma” imparts a false sense of historical closure, while “BlacKkKlansman” indicts such a sense of illusory victory. The film shows America to be shaped from birth to accommodate such lies. Lee opens “BlacKkKlansman” on a famous scene from “Gone with the Wind,” where Scarlett O’Hara crosses a battlefield strewn with the Confederate dead, ending on a rapturous close-up of the Confederate flag. We’re then introduced to fictional Dr. Kennebrew Beauregard (Alec Baldwin) who is rehearsing lines for a film castigating the “mongrelization” of America by a cabal of Jewish intellectuals looking to promote the dilution of the white race. Not long afterward, the film’s protagonist, Ron Stallworth (John David Washington), the first African-American police officer at the Colorado Springs Police Department, goes undercover to watch a speech given by former “Honorary Prime Minister” of the Black Panther Party, Kwame Ture (Corey Hawkins), who was born Stokely Carmichael. Speaking with black college students, Ture urges his audience to resist white conditioning, using art to define and celebrate their own notions of beauty. Of course, “BlacKkKlansman” is an example of such art, a refutation of biased culture that builds to a furious indictment of D.W. Griffith’s “The Birth of a Nation.” Following the cue of Ture’s sentiments, Lee cuts away from Ture’s speech to disembodied close-ups of faces of audience members, rhapsodizing their beauty, intelligence, and idealism. Lee also lingers on Ron, a man torn between an authentic desire to serve in the force and the knowledge of how said force often subjugates African-Americans. Like Lee’s “Do the Right Thing,” “Red Hook Summer,” “Chi-Raq,” and the severely underrated “Da Sweet Blood of Jesus,” “BlacKkKlansman” is a daring and tonally splintered melodrama with a pronounced rhetorical power. The Kwame Ture sequence is a masterful illustration of Lee’s grasp of the power of oration in warfare. Under Lee’s direction, actors inform words with an electrically tactile sense of weight. Ron eventually goes undercover in the KKK, speaking to officials on the phone while his Jewish partner, Flip (Adam Driver), plays Ron in the flesh, going to underground meetings to hear of vague plans to stage a terrorist attack. Lee often frames the faces of the KKK members in close-ups as they utter a torrent of unprintable obscenities, which the filmmaker informs with the same forcefulness that he lends to the progressive speeches. Comedy frequently lances the tension, particularly in scenes in which even aspiring terrorists are shown to be tormented by ordinary bureaucratic tediousness. Lee revels in Ron and Flip’s adventures, staging a live-wire version of a classic police procedural. But “BlacKkKlansman” is also radically free-form, shifting from one dialectic flourish to another, with blasts of music and lurid color that give the film an unruly and pulsating energy. Lee isn’t just a moralist, but a dramatist who gets off on displays of power—even those displays which repulse him. Quite a bit of this film’s provocation springs from Lee’s willingness to empathize with the white supremacists, grooving on the energy of their paranoia and hatred. Lee recognizes the dangerous and romantic simplicity of hatred: that it reduces unquantifiable human need to an exploitable binary. To a story, in other words.